Steampunk was a dream this salty sailor never saw come into life. Aye, I know that maybe Cyper-punk might still be an option, but that also be way beyond me lifespan. I reckon that these only be part of me fantasies, but that’s not too bad. If that game Dishonored taught me anythin’, it’s that my seas would be worse off if there actually be manufacturer’s of whale oil to fuel the steam punk fantasy. O’ course, that’s why I can always turn to games which feature the feel and look of punk, which is why I really fancy Clockwork Brain. 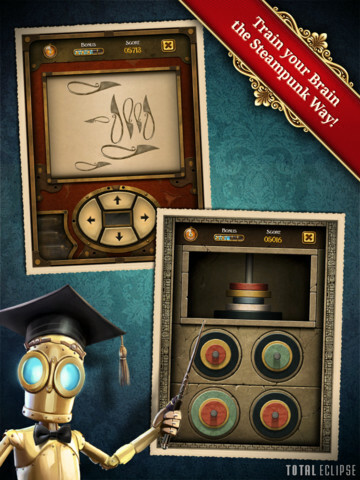 As the title might giveaway, this game has a lot to do with your brains. It’s a brain teaser, and it’s a good one at that. The initial package, which is free, can be downloaded with 4 default mini-games. However, that’s not the point here as each game when separated doesn’t really amount to anything. Instead, the game shines in another huge aspect, and that’s through how well the game does its job as a teaser. You see, like most good brain teaser games, it doesn’t dump you in the deep as soon as you start the game up. The title starts out with relatively ease challenges, teaching you the very basics before it starts to ramp up the difficulty. Then the game gets very interesting, as it starts to make it very challenging just to figure out the proper sequence between each puzzle. Suddenly, the game gets speedier and no matter how brainy you may be, the highest tier puzzles are going to break you somehow. 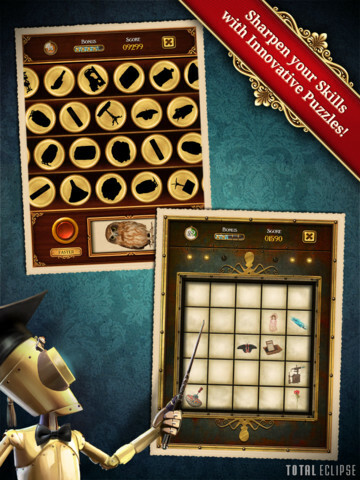 The four mini-games are as follows; Anagrams, tile counting, number sequencing, and pairing up silhouettes. All of which come in rapid succession when you start to solve them fast enough. Of course, the developers have to make money somehow, and while each additional level pack is around a dollar, they’re all worth it as they come with more game modes. Also, you can use the points you gained from your previous high scores as a form of currency within the game. If you were never a fan of the whole steam punk craze, then you might have a little trouble imagining what the look conveys. First off, all you have to imagine is a lot of bronze and iron, usually adorned in tons of bolts and contraptions. If you still have trouble getting it into your head, think about the aesthetics of Bioshock. This is primarily what Clockwork Brain looks like, and it does so very effectively. The game, while limited in flair, still looks visually striking enough to get you going. At the same time, your little mentor looks like a mix between C3PO and Wall-E, with big eyes set in a tall machine body. The machines’ animations are nice enough, and they actually go well with the copper and the earthy tones of the game itself. While the game only has 4 default game modes, the way it mixes the process up is the real star of the show. Furthermore, the additional challenge packs make for an awesome experience, and well worth the dollar you spend on each of them. Pick this title up if you like being mentally challenged – er that came out wrong – this savvy old Pirate is losing his marvels slowly!